Walking up and down the floors of the massive multi-level arcades in Akihabara can trigger some unexpected nostalgic responses, but I certainly wasn’t expecting this one. “See? Rainbow Edition.” It was the familiar logo for 1992's Street Fighter II: Champion Edition, but decorated in a garish assortment of mismatched colors. This identified it as the world’s most notorious bootleg arcade game, an altered version of Capcom’s incredibly popular fighting game. A fan mod before fan mods were a thing, but also big business, as the bootleggers sold quite a few of these around the world. Still, to see one set up in a major Japanese arcade in the year 2018 was a surprising thing, so I had to put 100 yen in. “Watch this,” I said, leaping into the air as Ryu and throwing a Hadoken from the sky. I tried the Hurricane Kick in the air as well, which ended up launching me to the other side of the playfield with ludicrous speed. A Shoryuken on the ground also sent Ryu flying horizontally to the far side of the stage. That’s the same fight as the image at the top of this story. 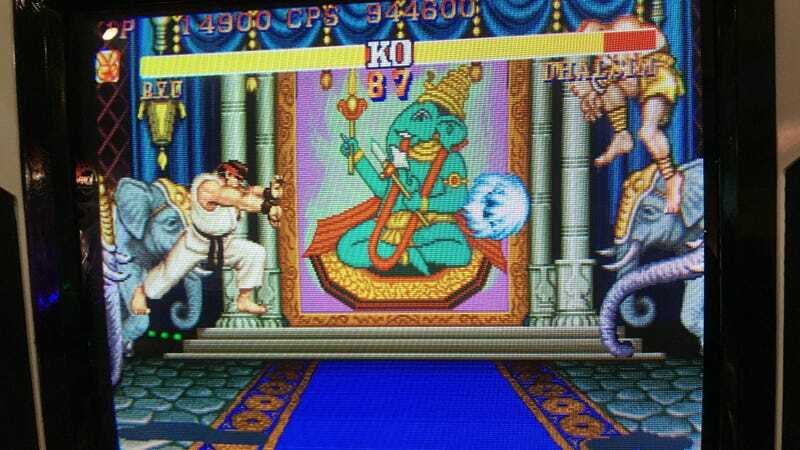 I started out fighting Dhalsim, who switched to Chun-Li and Guile before the end. This victory was short-lived, as the next fight was against another Ryu, who had no problem filling the screen with his own fireballs and Shoryukening me from 10 meters away.